According to nutritionists and fitness experts, well balanced homemade pasta helps you to maintain a good weight while still enjoying your diet. Homemade pasta is therefore not only delicious but also nutritious and healthy. However, making pasta at home without a pasta maker machine is stressful, tedious and messy for professionals and novices alike. Do not worry, with the Norpro Pasta Machine pasta machine is making fresh pasta at home is effortless and fun. 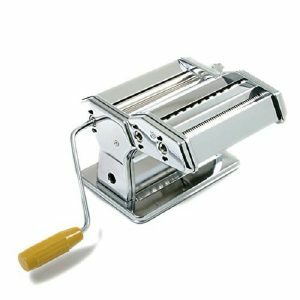 What makes the Norpro Pasta Machine a good buy? Well, this manual pasta maker has a great price, a stylish design and a really impressive performance. These are some key tips to consider when buying a pasta maker. This machine has a great size too hence portable and easy to store. Read through this detailed Norpro Pasta Machine review and find out the features that make it an automatic choice for many homemade pasta freaks. This pasta machine is one of the most stylish manual pasta machines. Chrome plated steel make up the body while nickel plated steel makes up the rollers. The design and stylish look give the kitchen toy a stunning lovely look on top of your kitchen cabinet! 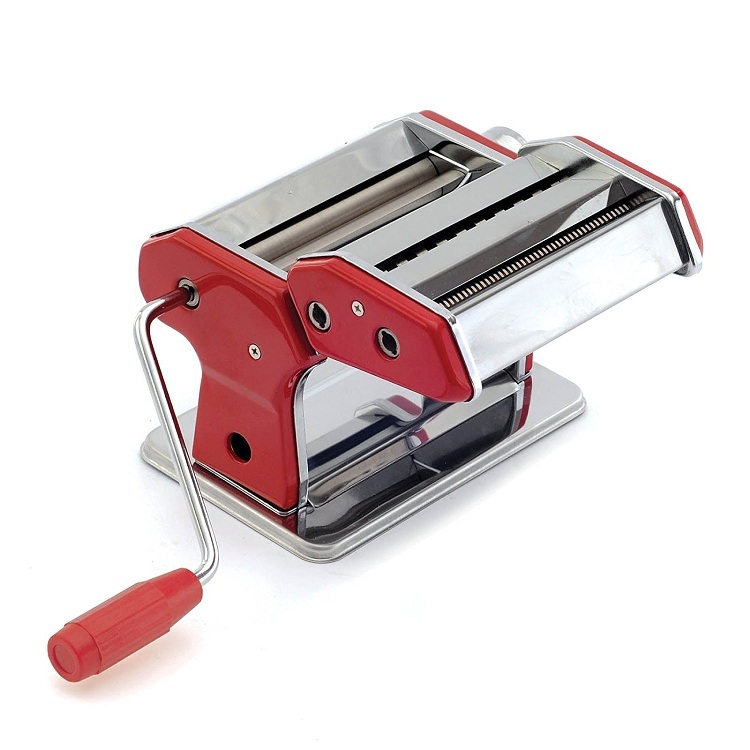 Again, made of impressive noncorrosive metals, the pasta machine is resistant to rust and does not fade. The nor pro machine measures 8 inches by 5 inches in length and width respectively and a height of 5 inches. These dimensions make it look compact, sturdy hence portable and easy to store. It fits perfectly in an average kitchen cabinet or shelf for anyone who would not prefer to leave it on top of the cabinet after use. Most people are reluctant to buy pasta maker machines for two reasons. First, most pasta maker machines are too complicated to operate. Norpro pasta machine provides a simple to understand instruction manual. This manual is easy to follow and is one of the reasons why the Norpro kitchen equipment is ideal for everyone including first-time pasta machine owners. Secondly, making various types of pasta if you have no knowledge of various recipes is a difficult task. It would mean restraining yourself to a limited number of recipes. This is why the booklet comes in handy. It gives you a chance to make unique and tasty pasta which keeps your diet tasty, unique and captivating. As a matter of fact, this gives you a chance to try out more creative recipes and perfect your culinary skills. This machine is capable of cutting pasta into different thicknesses. This makes it possible for producing pasta of different shapes and types. 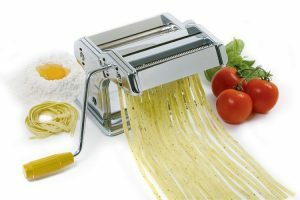 It can roll pasta ranging from 1.5 mm vermicelli- spaghetti-like pasta and other pasta sheets as well as 6 mm fettuccine. This feature enables you to enjoy varieties of pasta as you make good use of the machine. No matter what types of ingredients you prefer to have your pasta, the Norpro pasta machine will give you unimaginable results. Ranging from basic ingredients like water, sugar, and floor to more complex and healthier ingredients like honey, milk and vegetable products, the machine will deliver. With these options, you get to enjoy various pasta. 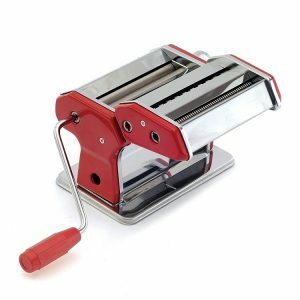 The good news for those who would like to have an electric pasta machine in a more affordable way will find this particular machine likable. The inclusion of the motor into this pasta machine makes your work faster and absolutely more effortless. This is because your machine will have a performance similar to any of the best electric pasta makers. For those who do not like cranking a pasta machine and feeding the dough into the roller space at the same time. How about letting the motor do the turning for you as you concentrate on feeding your dough on the rollers? Well, this will not only be effortless but also ensures that your pasta is of more uniform shape and thickness. It is, therefore, an opportunity to produce better quality pasta without making it a big hassle. We have discussed some exciting features of this lovely machine. Well, we are yet to find out more in the pros section of this comprehensive Norpro pasta machine review. With all the great features, this machine comes at an unbelievable best price from Amazon. In fact, of all the manual pasta maker machines, this is one of the most pocket-friendly. This machine has all the qualities of the best pasta maker machines in the market despite the low price. It is solid, strong and delivers what it promises. Moreover, the all solid metallic build makes it look classic and expensive unlike cheap -looking plastic coated machines. Q: How wide is the sheet pasta? Q: Is this machine ideal for a novice? A: Yes. Whether you have no experience with pasta makers, or you have never made pasta before, this is your machine. Q: Can the machine make a fondant? You now have no reason to go through the messy process of making pasta at home without a pasta maker. The Norpro Pasta Machine at an affordable price gives you the chance to make your menu lively and enjoyable. 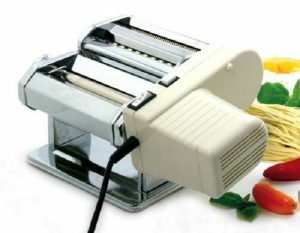 It is versatile, durable and can be upgraded to an electric pasta machine. Anyone with a lot of experience in pasta making will find this machine fun and full of potential while novices will find it easy to use and exciting. Its versatility and ease of use make it a great machine for your kitchen as you will never end up with it gathering dust on your shelves.